Hi, I'm Harry, and this is my movie. The Harry Hill Movie was decidedly not greeted with rapturous applause by audiences high from TV Burp and, erm, You’ve Been Framed (you’d have thought anyone watching the latter would welcome any old crap). Undoubtedly, this is a very patchy affair. Possibly, if you appreciate Hill mocking the slenderest of motivations for the plot, you will be on-board to at least get the most out of it. While it’s no surprise that a performer schooled in sketch comedy should deliver a movie as episodic as this, it is disappointing that the randomness isn’t more off the wall. Too frequently, at a loss over how to pad out 90 minutes, Hill comes up with a deflated musical number or a so-so plot diversion. But I can’t come out with a full-on attack of The Movie; it’s rarely more than a minute or two away from a chuckle, and if you like Hill as a performer (why else would you be watching?) he’s never less than an amiable presence. Hill’s takes the rise out of movie conventions from the start, and it’s not for nothing he has mentioned Pee Wee’s Big Adventure as a template. The plot hinges on the least significant of events; Harry’s hamster Abu only has a week to live, so he takes him on holiday to Blackpool (“City of a thousand dreams”). Sprinkled upon this dramatically bereft premise are the clichés of movie villain plotting (but on a budget of “£20,000”). Harry’s long lost evil twin brother (Matt Lucas, whose career quickly transitioned from being likeably exuberant to shouty and annoying) wishes to get hold of Abu (there are reasons, but really it’s just “because”) and sets some henchmen on his trail (Inbetweeners’ Simon Bird and Richard Kiel-alike Guillaume Delauney). I wasn’t really aware of Bird, as I’m not an Inbetweeners fan; he does reasonably, although he maybe doesn’t have the capacity for hammy caricature that serves Hill best (his Justin Bieber ”disguise” is probably his best moment). Delauney gets more laughs, somewhere between Jaws and Bernard Bresslaw. Hill’s co-star, aside from Abu, is Julie Walters. She’s in Acorn Antiques mode, and is never at her best when over-indulged. It’s partly Hill’s fault (with co-writers Jon Foster and James Lamon), giving her the hipster granny part (she has to rap at one point, which is toe-curling). Her best moments are during the mobility scooter chase with Harry that opens the movie (this is just the kind of upbeat, fourth wall breaking irreverence that is Hill at his best; it’s mostly downhill from there) and the “Nan Fu” fight sequence (which is all about the amusing graphics overlaid, rather than it being inherently funny to have a granny beating up bad guys, not when Steptoe and Son did it and not now). Hill would have been better off casting Jim Broadbent as Nan rather than as the nuclear power station receptionist; great capital is made of the British drag tradition here, so why not take it to its logical extreme? Johnny Vegas voices Abu, which is a big mistake. Vegas is okay when he’s in his Eye-ore like element, but he’s over-familiar and tiresome here. Abu could have been very funny but the voice casting kills it. Many of Hill’s best moments historically come from interactions with post-modern puppetry, and outside of Abu he boasts an encounter with a machine gun nest of chickens in his back garden that hits just the right cartoonish tone. Likewise, the French fox disguised as Abu is wonderfully absurd, and the visualisation will be familiar to anyone who has seen Ren disguised as Stimpy in Ren and Stimpy. One gets the impression Hill has little interest in quality control, content to throw in anything and everything that might get this to movie length. Consequently, there’s a pervading slackness to the construction, and arbitrariness to scenes following scenes. This sort of thing doesn’t matter so much in an Airplane! type spoof, but Hill’s digression into the home of the shell people isn’t a funny idea and it isn’t weird enough to make capital from. Julian Barratt deadpans sportingly as their king, but he’d have been better to pitch in on script duties. Sheridan Smith is also laboured as Harry’s love interest; instead Hill should have gone all meta about the need to feature a love interest in any given movie (why not, he comments flippantly on nearly everything else). Steve Bendelack directs, previously having tackled a couple of TV to big screen transitions (Mr Bean’s Holiday, League of Gentlemen’s Apocalypse), and does so with indifferent competence. This is day-glo and sunny, with a nice line in ‘70s wallpaper, but there’s a point where reproducing the cheerful cheapness of TV seems both too studied and too careless. For every moment of inspiration (the satnav and its “Angry White Van Man”, the car disguised as a traffic cone, the obsession with montages including one set to The Flashing Blade theme), there are more that stumble (crappy/unfunny dance numbers including Shingai Shoniwa singing about a carwash, presumably just because she’s in Hill’s address book) or just sort of sit there (a Jurassic Park reference is likable enough, but the giant brains aren’t funny; a visit to a nuclear power station is commendably anti-; but Abu-zilla is a familiar spoof too many, and notably Pee Wee went there first). Musicality is one of Hill’s great loves, and some of his best moments on TV come from his whacky riffs on classics (Popcorn is great, accompanying the scooter chase). They tend to stumble here, without a sharp enough focus or wit. It’s fun to see The Magic Numbers, but The Dachshund Five is a better play on words than it is an extended joke. 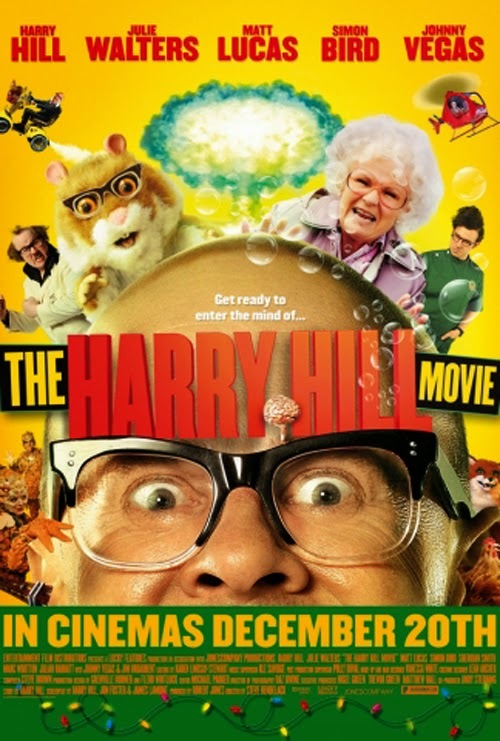 So The Harry Hill Movie doesn’t deserve its concerted slating. It’s not very good, it could never be hailed as a neglected classic, but big screen transitions from TV performers rarely are. I expect something similar would have resulted had Reeves and Mortimer ever made a cinema excursion, although they are also really bad actors (as their Randall and Hopkirk remake proved). Hill plays “himself”, which means you know what you’re getting. Unlike Python, who only got better in their movie incarnations (well, two of them at least), Hill is content to noodle and doodle without ever trying to fit the scope of cinema, failing to recognise that the same thing can’t just be stirred and repeated. So he saddles himself with tepid interludes. But, if this overstays its welcome, it doesn’t teeter over the brink into being out-and-out awful. I wish I was the monster that you think I am. I saved the therapist for you. Your dead soul is killing his living skin. I am a werewolf, not a Golden Retriever. Apes do not want war! No, I just, like, zoned out for a second. Do you think I should do a human interest story? This is it. This is the moment of my death. You’re the Compliance Officer. It’s your call. I’m yours and I’m not yours.